This is a great way to jump-start your fitness! Do you need some short-term, concentrated personal attention, in order to segue you to the condition where you are able to work out on your own? 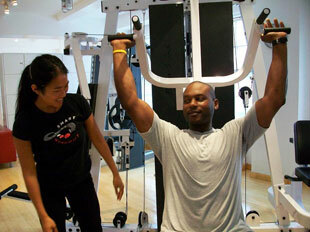 Smart Workout’s Six Week Shape-Up is the program for you. 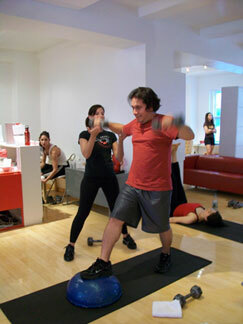 This package consists of 12 personal training sessions, and 12 small group classes. At the first personal training session, 12 different tests will be given to determine baseline measures of muscle strength, endurance, cardio-respiratory fitness, and fat to muscle ratio. An interview will elicit exercise modality preferences; medical history, and fitness needs, and then goals will be set for the conclusion of the 6 week term. Then a schedule will be set for the rest of the week, which will include 2 classes (a resistance class, and a cardio class), and a personal training session. The next 10 personal training sessions, which will be tailored to individual needs and preferences, will consist of a strength training module and a cardio module, each of which will differ from session to session, to ensure a totally rounded workout regime, and gradual increases in workload. At the conclusion of each week, a schedule will be set for the succeeding week, consisting of 2 personal training sessions, and 2 exercise classes. At the last personal training session, the physical tests will be repeated, to measure changes in the baseline numbers, and to assess progress towards fitness goals. If you should later decide to join Smart Workout, you would get a rebate of $300.